With 50+ years in the industry and more than 100 pinball machines under his belt, it's no surprise that many of our Pinball Heroes named one man the most influential to their careers. Of course we wanted to interview the great man himself, but being opposite sides of the Atlantic and only one of us owning a computer (and the other breaking them regularly) this might be a bit of a challenge! Jim Schelberg from the PinGame Journal kindly offered to conduct and record the interview by telephone and I've just finished typing it up. It gives me enormous pleasure to announce the latest in our series of Pinball Heroes. The Pinball Blog: Let's start at the beginning, you've told this story many times but for people who may not have heard it, can you tell us how you found yourself in Chicago and in the pinball business? Steve Kordek: I had at the time, left the Forest Service in Idaho where I had worked in the Rangers Station. They wanted me to come back after I'd gone home for the winter and they had a contract they wanted me to sign by May. They would take me back, put me into university in Montana to study forestry and I would stay there. I had no desire to stay in Idaho when I had a home of 8 brothers and sisters and my father and mother in Chicago. I went to church everyday hoping that I could get a job, it was very difficult to get a job during that period (1936-1937). What happened is I was walking one day in Chicago and it started raining. I had no umbrella, so I opened up the door to a factory just to get out of the rain and a woman asked me if I was looking for a job. I said YES! I'd walked into the Genco factory, I was 26 years old. TPB: Sadly Norm Clark recently passed away and it was you that gave him his first break in pinball. 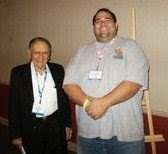 What was it like working with Norm and what are your memories of the man and his legacy? SK: For 20-something years I worked very closely with Norm Clark and I have personal experiences that I'd like to keep private for now. I will speak about them at Pinball Expo for the Norm Clark memorial. Some of them are very exciting and interesting and many people won't know about them. 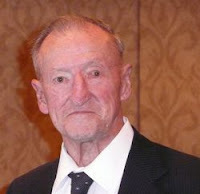 When I started for Williams in 1962 I had an opportunity to really start making games and I was making as many as 7 or 8 a year with no trouble at all. I was given the opportunity to get some assistance and I took Norm Clark who I'd worked with from engineering. He and I, for 15 years, alternated making games for Williams. 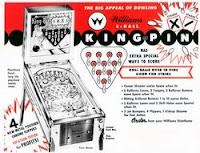 We had such a great run of games that at one time Williams controlled over 70% of the production of pin games in the world and we produced some of the greatest games ever. Normally a game would have 3000 made to pay for itself, we were averaging anywhere from 7-8,000 and some games as many as 12-15,000. My associating with Norm during that period was very, very, very good. We enjoyed working together, we had several experiences together that were very exciting..... we almost lived together! In 1975 he had personal problems that affected him and he left Williams. Whenever we were building games we would have the bosses at Williams look at our games. We also looked at each other's games. I built every game as he built every game. If we had a feature each of us wanted to use we alternated and we never had a problem. Norm Clark had some of the greatest soccer games and the funny part about it was when he was learning he only built one game in 1962 and then not another until 1964. Everybody wants his first game, King Pin. There's just something about it, something about playing it that makes it exciting. As he was learning his trade I was in the next room and I did everything I could to get him to understand what was right, what was wrong, what was good, what was bad and that's how we finally got together and starting building games. For 15 years we built games alternately. I had one hell of a time working with a guy who was really really great and he deserves all the credit he could get. TPB: How did Harvey Heiss end up with a pair of shoes nailed to the ceiling? 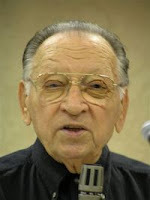 SK: Harvey Heiss was involved at Genco because he was the main designer at the time when I joined. 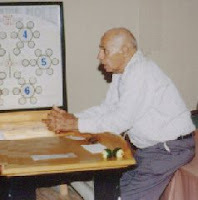 It was there that I learned from Harvey Heiss how to design games. He would teach me and tell me what was good for making games. It worked out very very good because there was a time in 1948 when he was hospitalised and I had to build a game all by myself. I built Triple Action with only 2 flippers at the bottom of the game and it's been that way ever since and I made myself quite a reputation. Harvey Heiss always had a pair of shoes that he changed into when he came to work and there was a way of getting his shoes nailed to the ceiling and that's where he found them. He had a sail-boat on lake Michigan. The mast was about 50 feet long and he used to put it in on top of his convertible and bring it in to the factory at about 3am so he could work on it over the winter! TPB: There are stories that some of the industry shows of the past were raunchy affairs with, shall we say, a lively social aspect! Any that you can tell us about? SK: All the time! Not too much I can tell you, but many of the games were dice games and they used to gamble like all hell. Women? Not in my case but maybe there were ladies involved! TPB: Can you tell us more about The Century Club and your role in it? SK: I started the Century Club because I wanted to get some pinball people together to discuss the problems that they had, the fun they had and everything else. I designed a game and called it Century Club because at that time there was a celebration of the century of music deals. I was the president of the Century Club for many years until I couldn't do it anymore. Steve Epstein was a good man for the job and I asked him to take over. 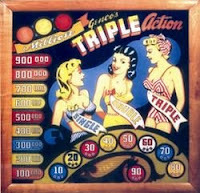 TPB: Budget restrictions led to just two flippers at the bottom of the playfield on Triple Action, a concept that then became common throughout the industry. If the budget had been available do you think pinball even today would be very different? SK: I was taught by Harvey Heiss to be conservative. They were building Humpty Dumpty with 6 flippers and when the show came in January 1948 there were about 8 other companies building games and every one of them copied Humpty Dumpty. Either 2 flippers on a side, 4 flippers on side or 6 flippers on side. I went ahead and put 2 only at bottom and made the game which topped the show and at the same time made a reputation for me. TPB: So many of our Pinball Heroes have said you are the man who has been the most influential in their careers, but who played the most significant roles in your own time in pinball? SK: I don't want to name names but I want to tell you that I pulled people off the production line who were inspectors, brought them into engineering, taught them how to design games and they turned out to be the best designers in the world. I spent a lot of time with the designers and I gave them all the credit whenever the bosses came around and would compliment something on a game, even if I'd had an influence in the design. I always gave credit to the people that were working for me. Most of them made unbelievable, unbelievable money! 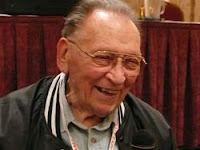 Harvey Heiss influenced my own games after that I would say people who were in the business who would in someway or other would tell me what was right and was wrong and what was good and what was bad. 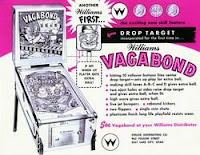 TPB: Vagabond was the first pinball machine to use a drop target. Where did you get the inspiration for that idea? SK: I had an idea that if I could hit a target and it disappeared that it would be exciting to know that you might have accomplished something unusual. If the target would come up and for whatever reason, some kind of scoring and when you hit it it went down. I decided it was a good way to do it with a single target. Gottlieb then came up with 2, 3, 4, 5 and 10 drop targets and they did a terrific job with that feature. Sometimes you come up with an idea that you put in a game and you don't change it but you may work on parts of the machine around the new idea but you don't change the idea if you have a good one as we had to patent some of it. TPB: What were your roles at Williams after you moved on from designing pinball machines? SK: I was an adviser to the designers. I also had an accumulation of about 10,000 brochures which I used to take care of requests from the field and getting feedback from the field, helping people research the machines for many years. I walked around and enjoyed watching the production efforts of the other designers who put their best into what they had. Every designer was a little bit different, every designer had a different idea on how to make a game right. 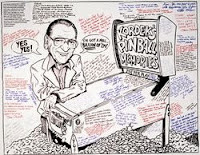 TPB: Finally I always ask our Pinball Heroes to sum up their involvement in pinball with one word or sentence, but seeing as your career is probably the longest of anybody we've spoken to, we'll allow you as many sentences as you like. SK: I would like to say, first of all in the position that I had, I had the greatest association with the finest people in the world. People who did very well and people who did very well by themselves, people for whom I trusted very well and people who I loved to work with and people who really did what I thought they should do and had some unbelievable experiences with some of the best people and engineers in the world. I'm 98 on 26th December this year and I have a lot to be thankful for, to God first of all, because the good Lord has been very good to me. Secondly I had a great wife who was with me for 62 years, I have brothers and sisters, I had 4 brothers 5 sisters and I still have 1 sister and 2 brothers alive with me and all I want to say is i thank God for every day that I'm alive and able to walk and take care of myself and hope that I can get out of some of the problems I have now. I had quite an operation recently and they tell me that at my age you don't heal as quick as you think you'd like to. I have done the best I could. Everything that I have done I've done for the good of the people that I worked for. I did the best I could for the individuals who were working with me and I did the best I could for the company itself to make money - and they made money! More pictures on this link. Please note: Mr Kordek asked that information within this interview should not be used elsewhere without permission. Likewise images here are used with permission and please check with the image owners that they are happy for them to be re-used. Many thanks to Jim Schelberg, Gary Flower & Duncan Brown for helping beyond the call of duty with this interview and of course HUGE thanks to Steve Kordek for taking the time to be featured as one of our Pinball Heroes. Also many thanks to all the great people who provided photographs for this interview. More Pinball Heroes coming soon! I have ment Steve in Chitown, and have one of the frist games He worked on " Gun Club" He is truly a great man, He has told Me the story about having to get out of the rain, Thank God for that rain.